What’s to be done with a bit of leftover flaked coconut and a lemon? I smell cookies! They are delicate and light but are also blessed with the chewy factor. They remind me of my childhood which for baking is always a good thing. I also love the way they hold their sort of dome-like shape. From the picture you can tell, you would almost want to stroke their furry little heads. In a bowl, combine the coconut, sugar and zest. Add the egg whites and mix until combined. Add the softened butter and combine. In another bowl sift the flour with the salt and baking powder. Add the sifted flour to the coconut mixture and combine with a spatula until it comes together and you have a smooth dough (do not over mix). Cover and keep in the fridge for 30 minutes. That way it will be easier to handle the dough for the next stage. Preheat the oven to 150ºC / 300ºF. Line a baking tray with baking paper. 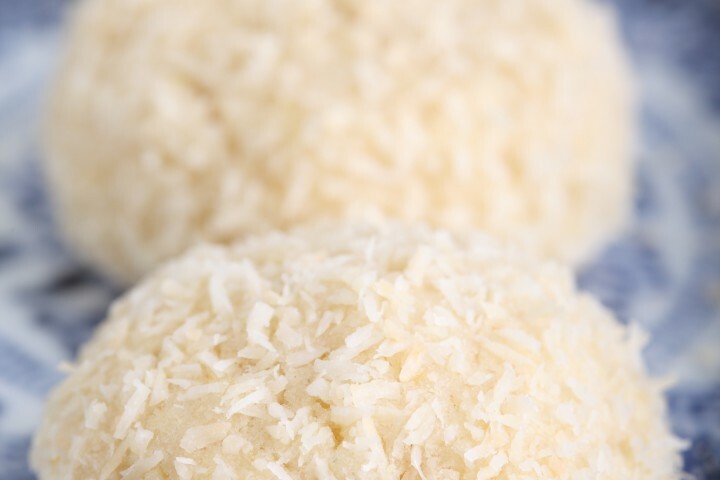 Take the dough from the fridge, form 24 equal sized balls and roll them in the coconut flakes. Place the balls on the tray and bake for 20-25 minutes until pale and ever so slightly golden (coconut that is too brown can have a bitter taste). Leave to cool on a wire rack. LOVED these – Delishiously chewy and not too sweet and all together delicious! Thank you so much for this feedback Lesley!